Sip, relax, and soak in beautiful Northern Virginia winery views at these vineyards close to Washington DC. Enjoy views of an historic battlefield, rolling hills, distant mountains, peaceful ponds, and leafy vineyards along with delicious Virginia wines. 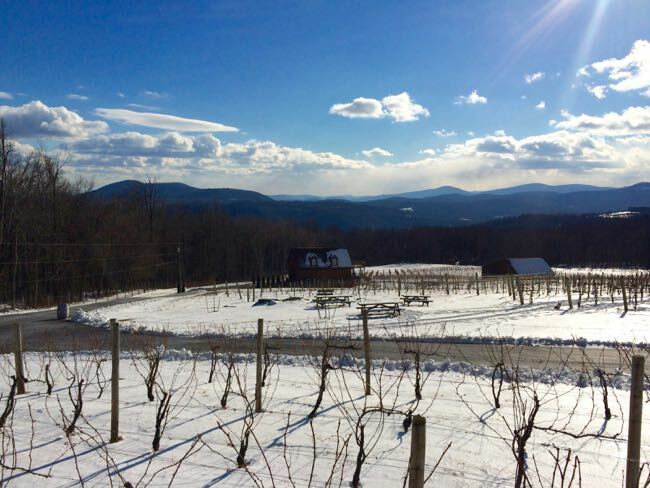 These spectacular views change with the seasons, offering beautiful Northern Virginia winery views all year long. 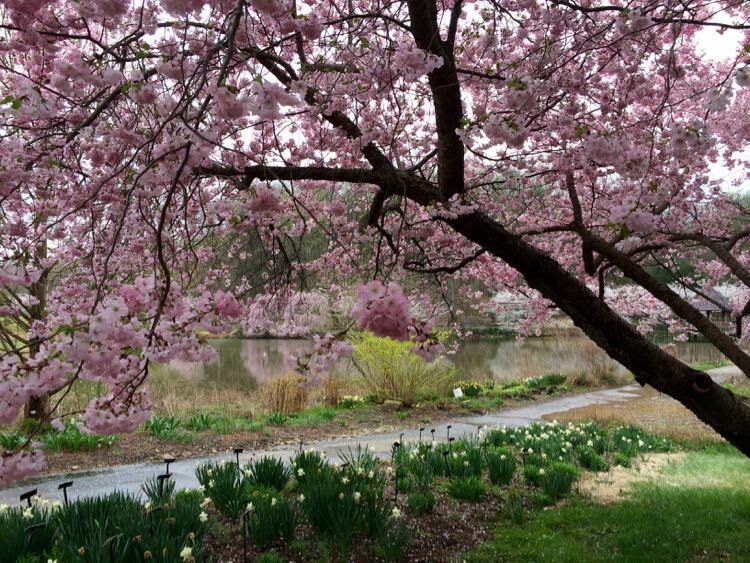 In spring, wildflowers dot the fields and low humidity means clearer skies. Summer brings green fields and leafy vines into view. Indoor tasting rooms and covered patios provide a place to escape the heat on steamy days. Fall foliage colors the vineyards and surrounding hills in Autumn. And snow-covered vineyards offer a romantic backdrop in winter. Some of the best wineries in Virginia are only an hour’s drive from Washington DC. 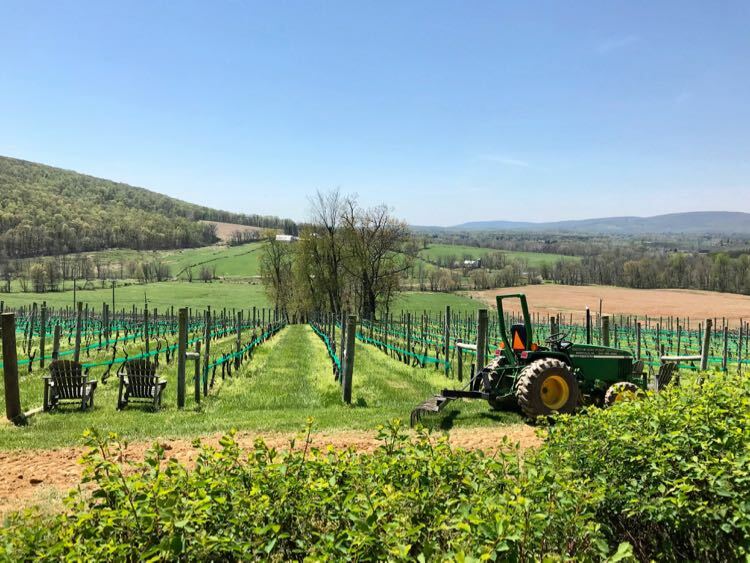 Most Northern Virginia wineries are located in Loudoun County, but one of the wineries on our list is in Fairfax County. Follow the direction links in each listing for a map to the Northern Virginia wineries listed here. 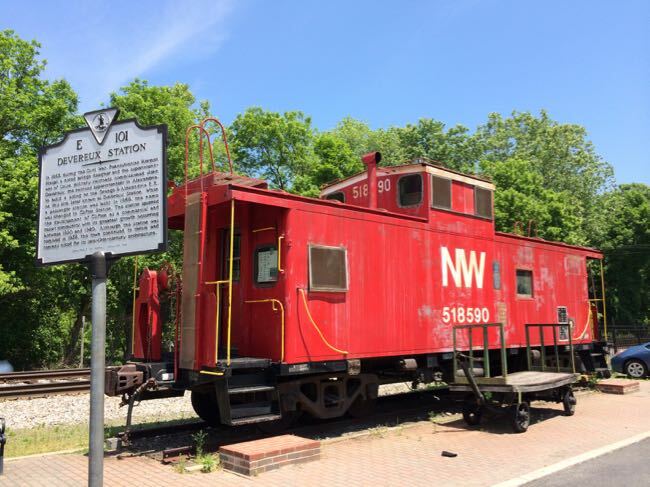 Take your time and head to Bluemont on a scenic drive through Loudoun County on the historic Snickersville Turnpike. If you have beer lovers along, visit Dirt Farm Brewing, right next door, for the same spectacular view and some very tasty brews. 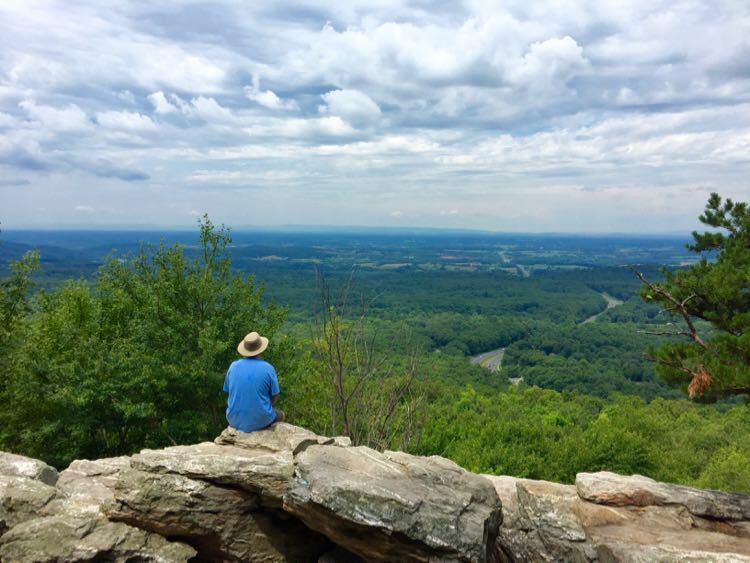 Hike to Bear’s Den Overlook before your Bluemont Vineyard visit, and you can see the westward view from the same mountains. Fox Meadow Winery also sits on Blue Ridge Mountain, and offers a gorgeous mountainous view toward Manassas Gap to the south. Their tasting room is a great option on chilly days, because you can enjoy the same view from inside, or out on the porch. While you relax with your wine, contemplate what the area was like during the Civil War. 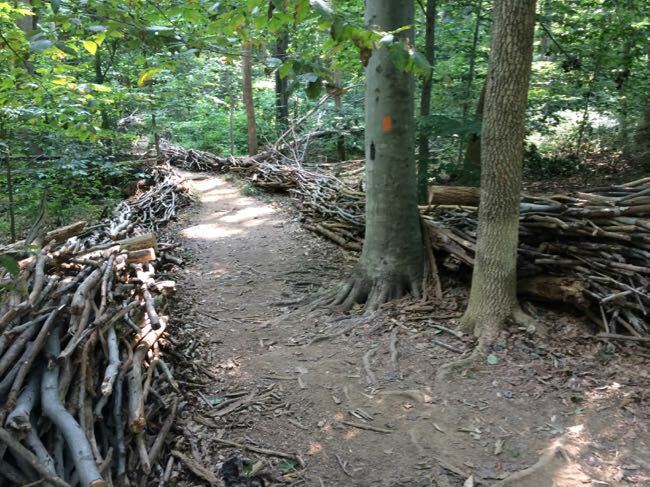 Manassas Gap was a strategic connector between the Piedmont and the Shenandoah Valley, and the site of multiple skirmishes. The winery is open daily, and is about 65 miles from Washington DC. Stone Tower Winery is located on Hogback Mountain, and the scenic drive to the vineyard is part of the fun. Once you arrive, you’ll love the view of rolling hills and vineyards from the expansive patio. The tasting barn is perfect on chilly (or hot) days, with lots of comfy seating. Views from the upstairs Tower View Tasting Room (restricted to visitors 21 and over) are also stunning. Stone Tower Winery is open Thursday through Monday. Stone Tower Winery is 45 miles from Washington DC. 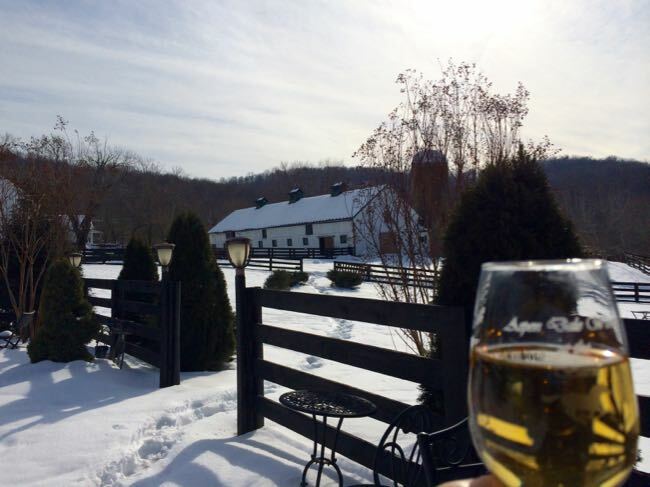 Extend your fun and visit several wineries in Loudoun County with a Leesburg weekend getaway. 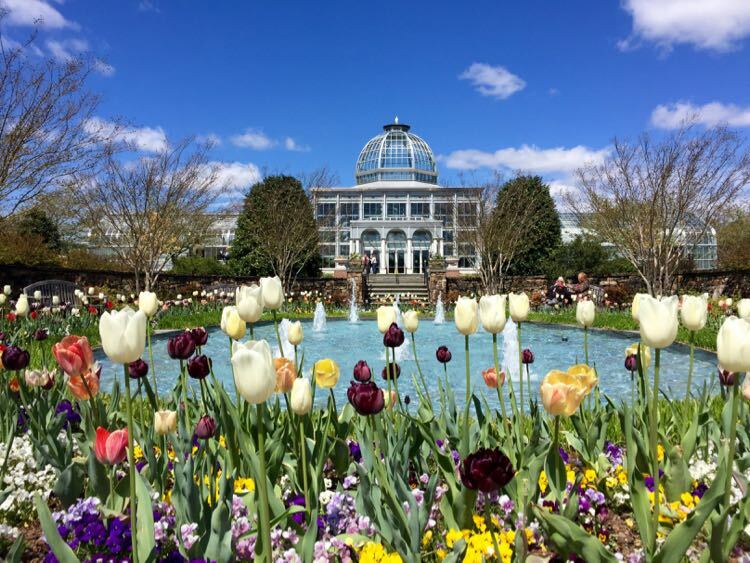 Lansdowne Resort and Spa is the perfect base for visiting wineries close to DC. There are some excellent Leesburg restaurants, historic sites, and antique shops when you’re ready for a wine break. Check availability and rates at Lansdowne Resort now. Hillsborough Winery is located in Loudoun County, on land once owned by George William Fairfax, a close friend of George Washington. In 2018, Hillsborough added a brewery, so now you can sample tasty brews and wine at this lovely location. The winery has a pleasant tasting room in a historic 1840s stone barn. But the best views are outside. Fortunately, two patios and a long pergola offer plenty of outdoor seating. Fun fact: the town of Hillsboro is the birthplace of Susan Koerner Wright, whose sons Wilbur and Orville invented the airplane. Open daily. Hillsborough Vineyard is just over 50 miles from Washington DC. 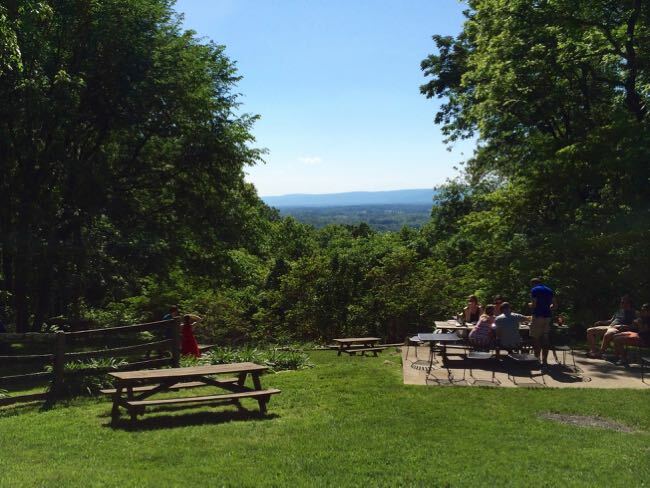 The oldest winery in Loudoun County, Willowcroft Winery sits atop Mt. Gilead with pretty views of the distant Blue Ridge Mountains. The first acre of vineyards was planted in 1981 when Virginia wine production was just beginning. The beautiful view is only available from the outdoor seating area, so Willowcroft is a great warm weather destination. When it’s too cold outside, you can enjoy your wine in a historic red barn which predates the Civil War. Willowcroft is abut 45 miles from DC and they suggest you follow their directions rather than rely on your GPS (which may steer you down a bumpy dirt road). Open Friday to Monday, year-round. Doukenie Winery sits at the foothills of the Blue Ridge, so your view is up into the hills rather than down into the valley. This makes the view from the patio and yard especially gorgeous when fall colors take over the hills. 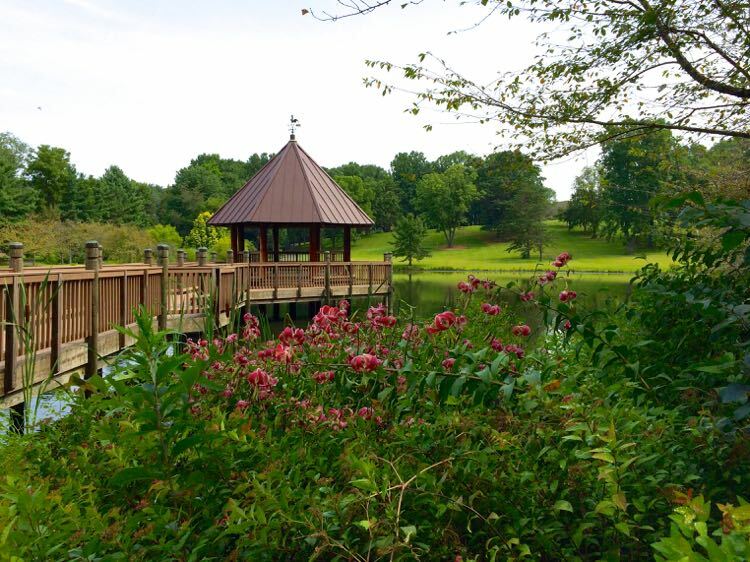 When the weather is nice, opt for a seat out by the pond or near the gazebo. There is plenty of open lawn to spread out and find a private space, or have room for active kids. Open daily. 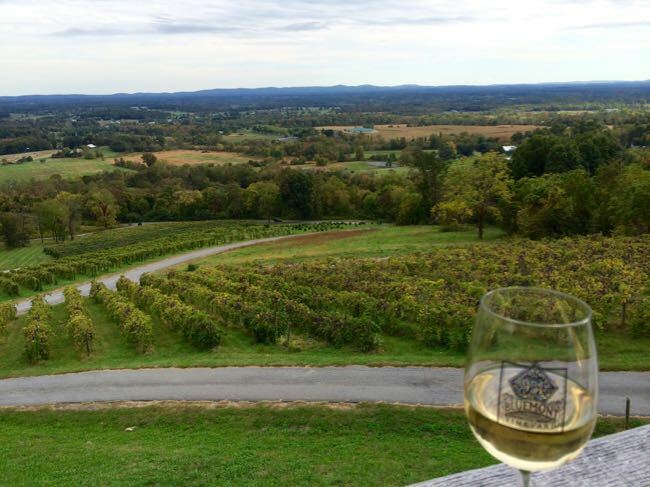 Doukenie Winery is about 50 miles from DC in the town of Purcellville. Visit Purcellville for antique shopping, craft beer and and spirits, and local dining. The patio at 8 Chains North offers serene views of the vineyard set in the rolling hills of the Piedmont. The large tasting room has lots of seating and large windows, so it’s a good alternative on cold weather days. 8 Chains is very family and dog friendly. They have a dedicated dog park where pets can be off leash, and leashed pets are welcome throughout the property. 8 Chains is open Thursday through Monday, and is about 55 miles from DC, near route 9 in Leesburg. The view at Aspen Dale Winery is not high on drama. But the lovely barn at this horse farm offers an idyllic view of Virginia country life. You’ll have to sit outside to get the view, but we enjoyed a sunny table even with snow on the ground. When it’s too cold outside, aim for a comfy chair by the fireplace, one of our picks for warm winter outings close to home. In warm weather, take a stroll around the grounds to visit the miniature horses and their full-sized friends. Open daily in summer; check for winter hours. Aspen Dale Winery is about 55 miles from DC near route 66. 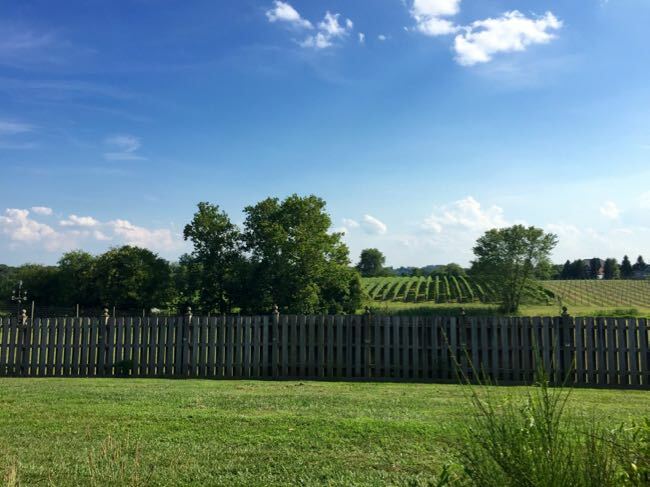 The Winery at Bull Run offers a nice view with an interesting history. 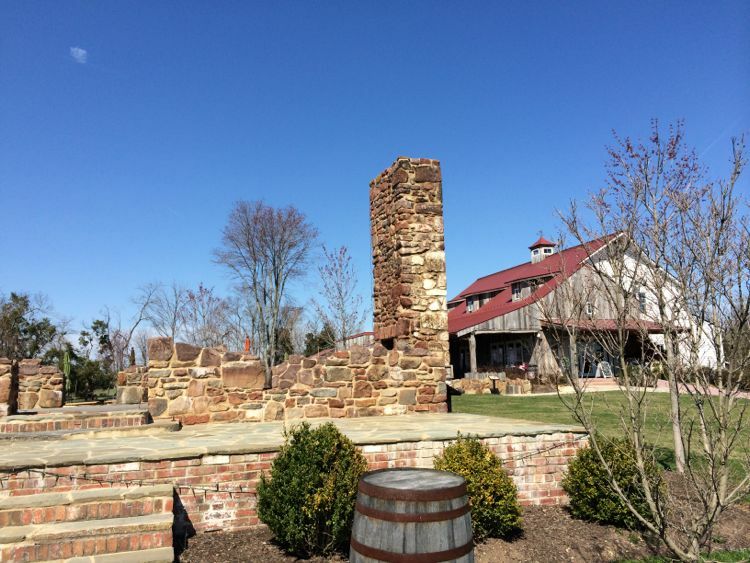 The Winery property includes the remains of buildings from the 1800s, including a stone patio that was present during the Battle of First Manassas. 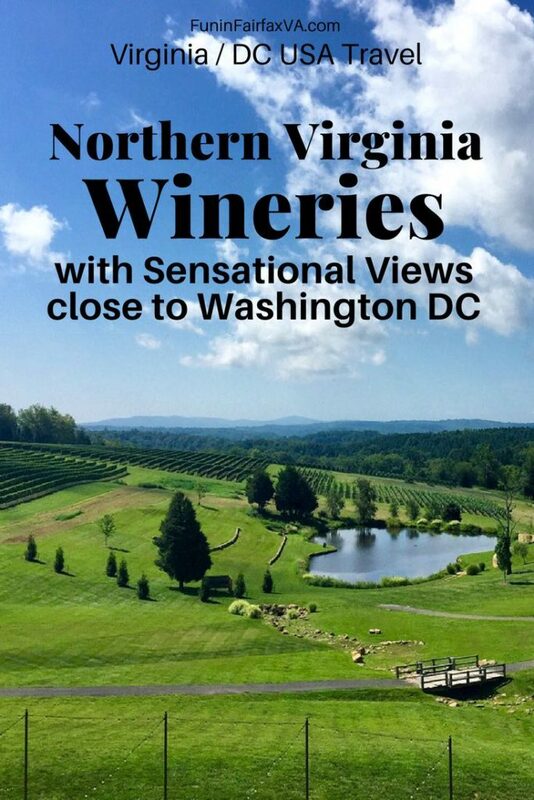 This is the closest Northern Virginia winery view to Washington DC on our list. The Battle of First Manassas, the first major conflict of the Civil War, started right next to the vineyard property. Picnickers from as far away as DC sat on the hillside to watch the battle. Some spectators got too close and were caught up in the chaotic Union retreat. At least one picnicker, New York Rep Alfred Ely, was taken prisoner by the Confederates. There are lots of options for relaxing with your wine. Rockers line the patio, and there are two large outdoor areas with picnic tables—one for adults and one for families with children. There is also a large tasting barn with indoor seating and some interesting displays of artifacts found on the property. Dogs are not allowed at the winery. Open daily and only 35 miles west on route 66. There is one winery closer to DC. Paradise Springs Winery, the first winery to open in Fairfax County, is a lovely stop on a visit to the charming town of Clifton. 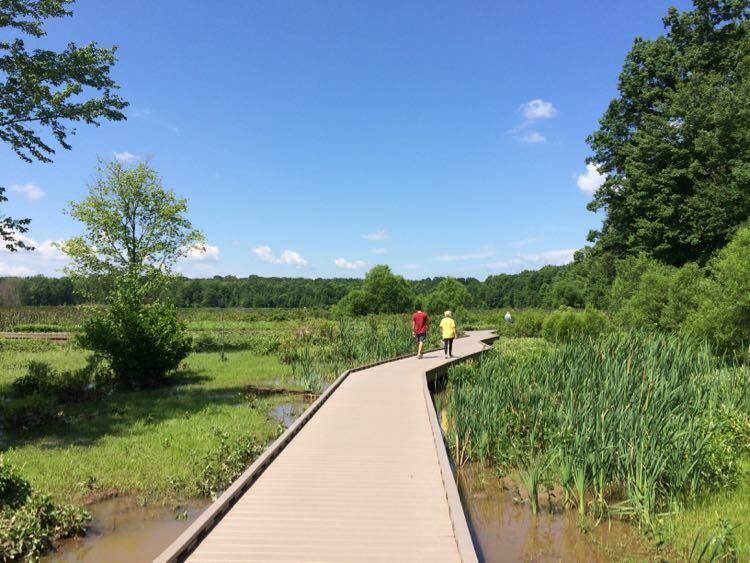 Hike the First Loop Trail at Manassas National Battlefield to learn more about the battle as you walk the property where it took place. Stop at the historic Stone Bridge, right next to the winery entrance, even if you don’t plan to hike. 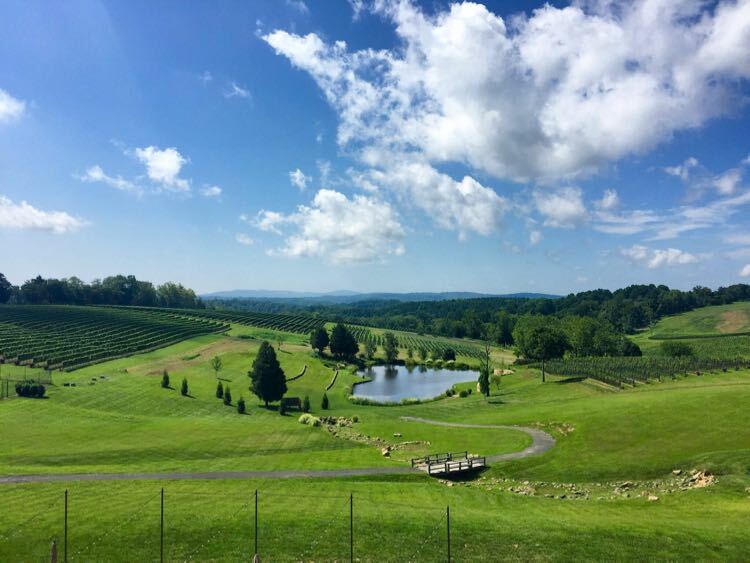 We love the spectacular Northern Virginia winery views on our list, but there are many more Virginia wineries worth a visit. The vineyards and wineries near Charlottesville are stunning. 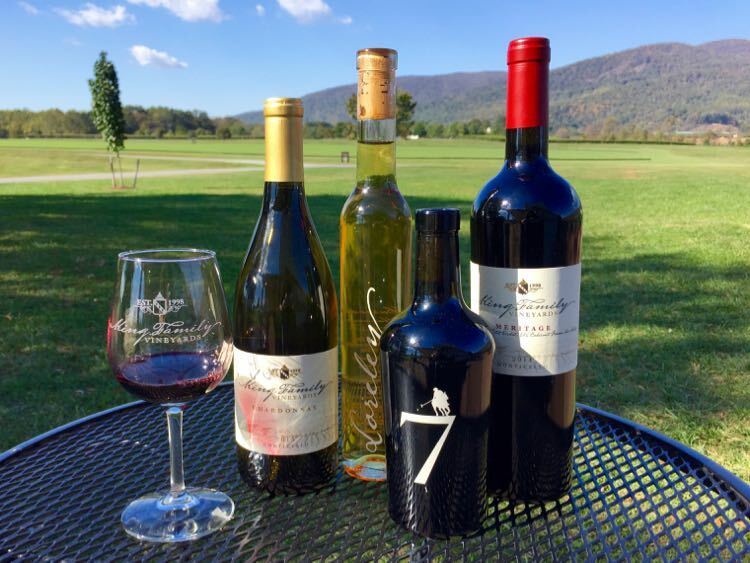 Watch a polo match as you sip at King Family Vineyards in Crozet. Jefferson Vineyards is a perfect stop for wine tasting and scenic views of Mt Alto, after a visit to Thomas Jefferson’s Monticello. 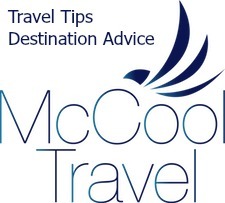 Discover more fun places to visit while Wine Tasting in Charlottesville Virginia. 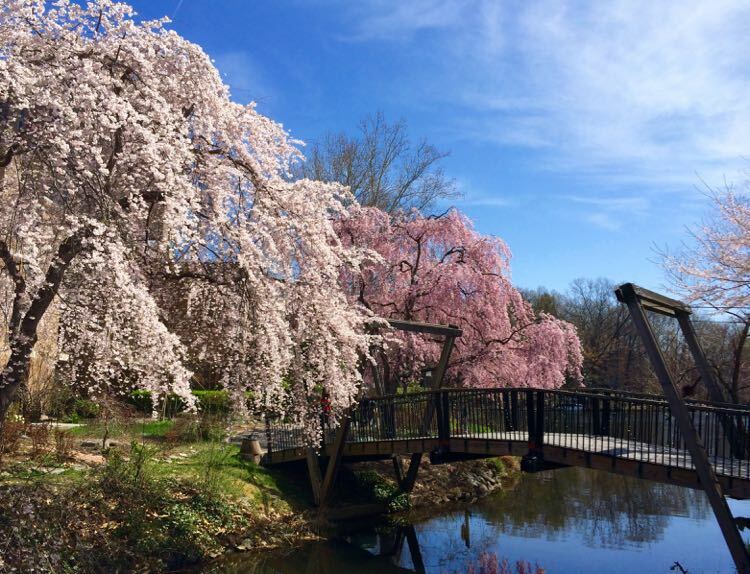 Plan a weekend in Charlottesville with our complete getaway guide. Check prices and availability for Charlottesville hotels now. The Draftsman Hotel has comfortable rooms and a central location near UVA. Be sure to eat at the delicious Renewal restaurant. If dogs and wine are you idea of a perfect pairing, check ahead for winery dog policies. Leashed dogs are welcome at many wineries, but rules vary. If a winery sells food, they usually don’t allow you to bring your own picnic. 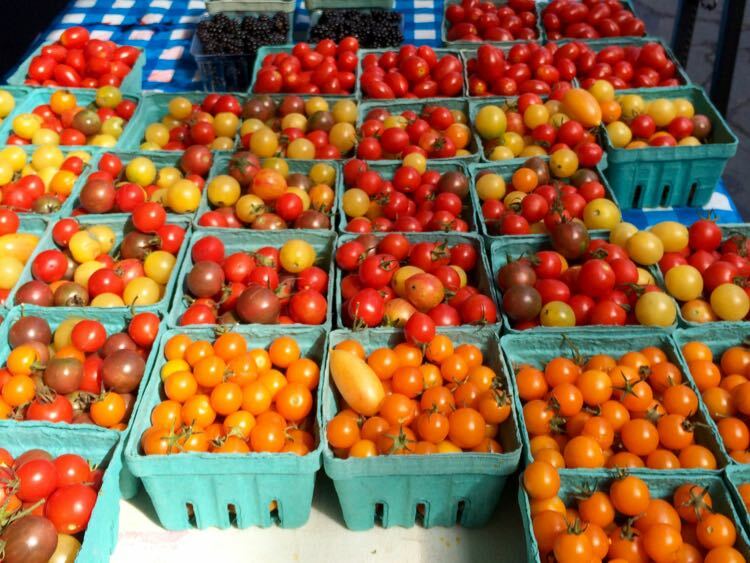 Follow the links to double-check on food policies at the Virginia wineries you plan to visit. You may not bring outside alcohol onto any winery property, per Virginia law. Most wineries host live music and special events, especially on weekends. The extra fun can mean extra crowds, so arrive early if you’re counting on visiting a particular winery. Find a nice introduction to favorite Virginia grapes, winery maps and lists by region, plus a handy checklist for tracking your winery visits in the Virginia Wine Country Travel Journal. Virginia wine country is full of wonderful wineries and so many amazing views. 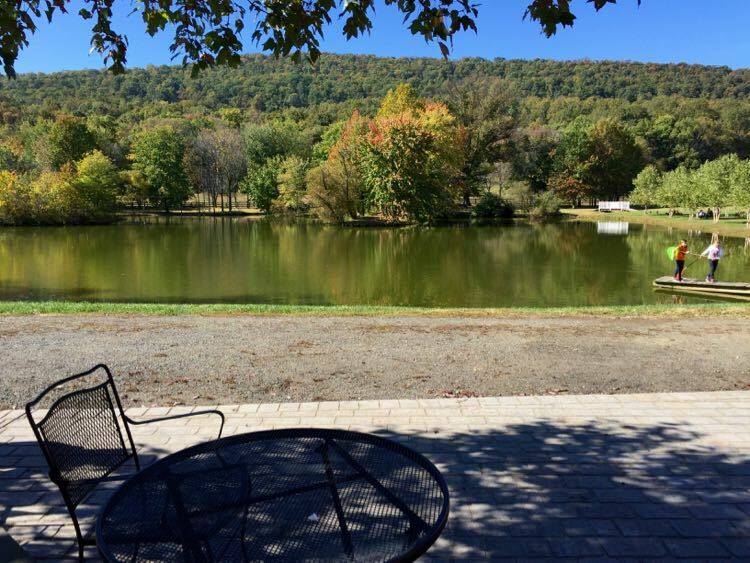 What Northern Virginia winery views should we add to our list? Wow, didn’t know there are a lot of wineries and these cool views near the DC area! Thanks. A lot of people don’t realize there is a major wine region less than an hour from DC. A nice escape from the city! 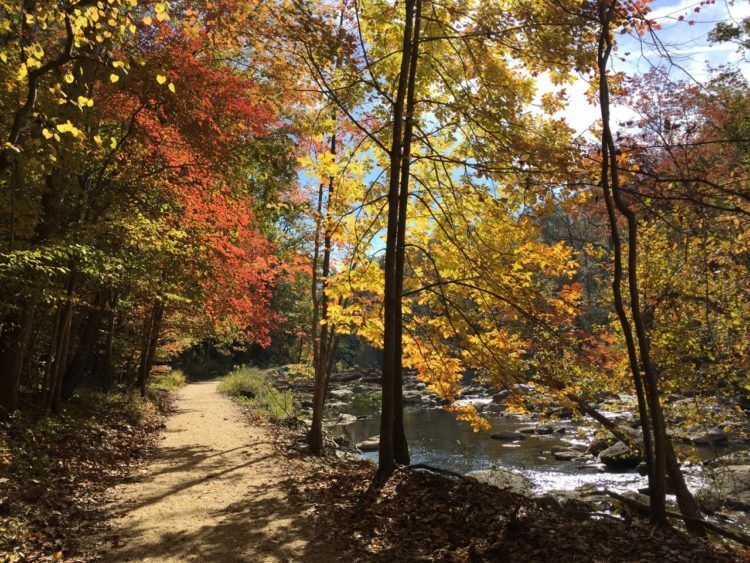 Thanks for sharing these beautiful photos of the northern Virginia wineries. It was especially interesting to see the different seasons. Thank you for the feedback! It is fun to go to the wineries in different seasons and see how the view has changed. I need to get out there more this fall and get some pics of the foliage. I remember some of these views from when we made a trip out to Virginia wine country years ago. I’m curious to make another visit to see how things have changed with Virginia wineries and their wine. There are new Virginia wineries opening every year, and many of the established wineries are expanding and updating their facilities. Hope you get a chance to visit Virginia wineries again to check out all the changes and drink more tasty wine.